Rev. 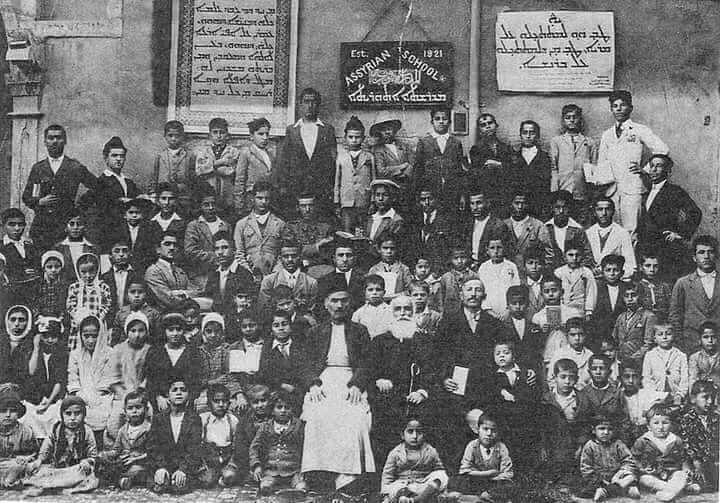 Yosip Qelaita's (Joseph DeKelaita) Assyrian school in Mosul operated from 1921-1945; it was a remarkable school that produced the next generation of Assyrian leaders and intellectuals. 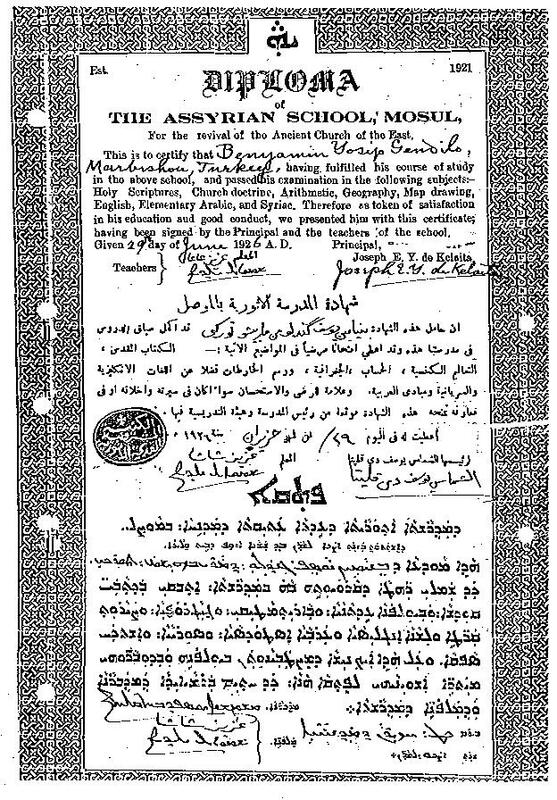 The following information was obtained from Shemasha (Deacon) Yosip Zia (#42), who attended the school from 1921-1924. The school year began on November 1st and ended on May 30th. The school was co-ed, with boys and girls attending classes (in the photograph there is only one girl shown, #132); Shemasha Zia says there were many many girls in the school, but few made it to the advanced classes. 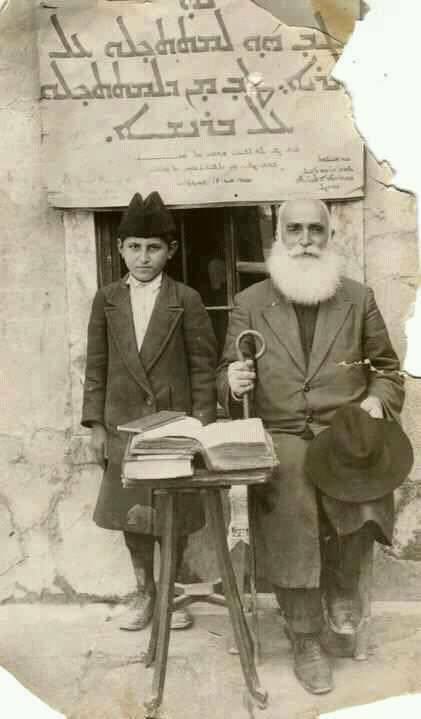 In 1921 a diasagreement between Benyamin Arsanis and Rev. Yosip Qelaita arose regarding the curriculum. 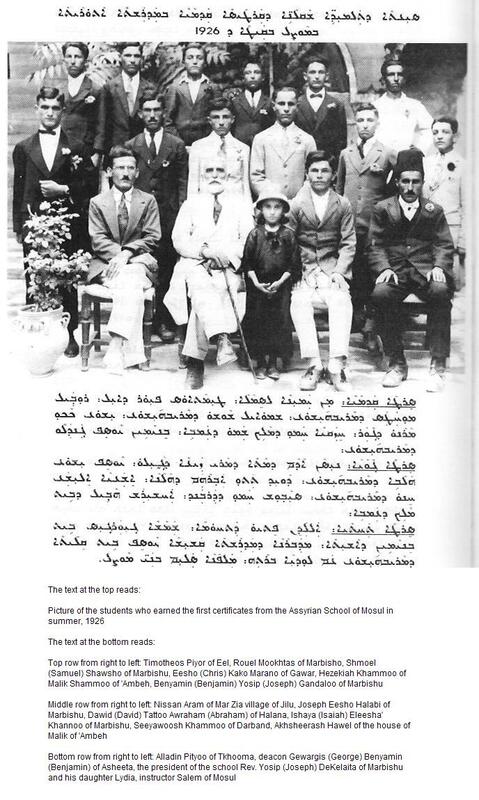 Benyamin Arsanis wanted to stress history and science, particularly Assyrian history, and wanted a more secular curriculum, while Qasha Qelaita wanted a more religious curriculum. The Mar Shimun (Patriarch of the Assyrian Church of the East) sided with Rev. Qelaita and Benyamin Arsanis was forced to leave the school. 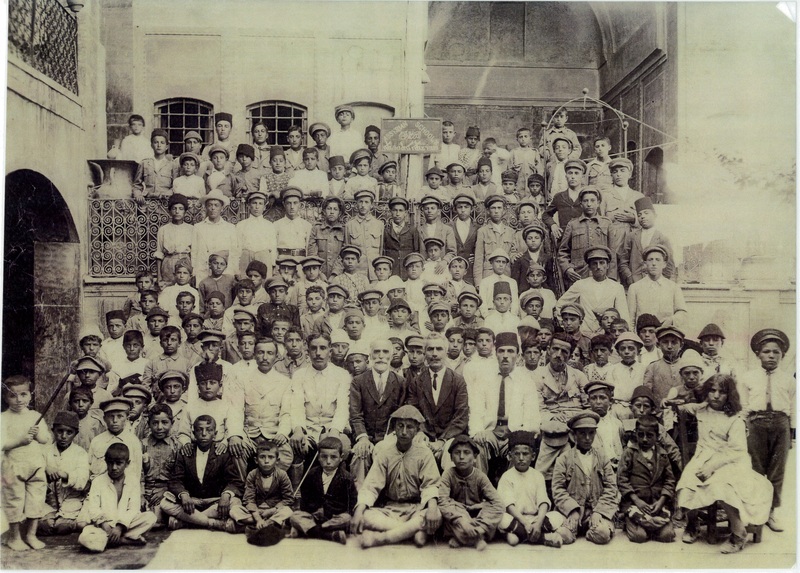 This photograph was taken in 1922 and shows 129 students and 5 instructors. Rev. Qelaita, a deacon (shemasha) at the time, is the white-bearded man seated in the middle (#114). Some of the names of these students are known, others are not. We wish to identify each student in this photograph. 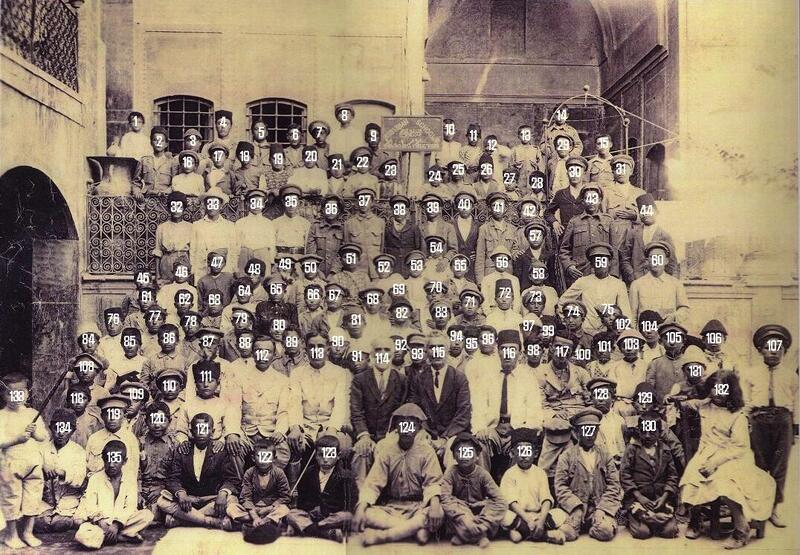 We also would like to compile a list of all the students that attended the Assyrian School of Mosul. If you recognize anyone in this photograph or know of anyone who attended this school, click below to send us this information. Click here for the full-sized picture. 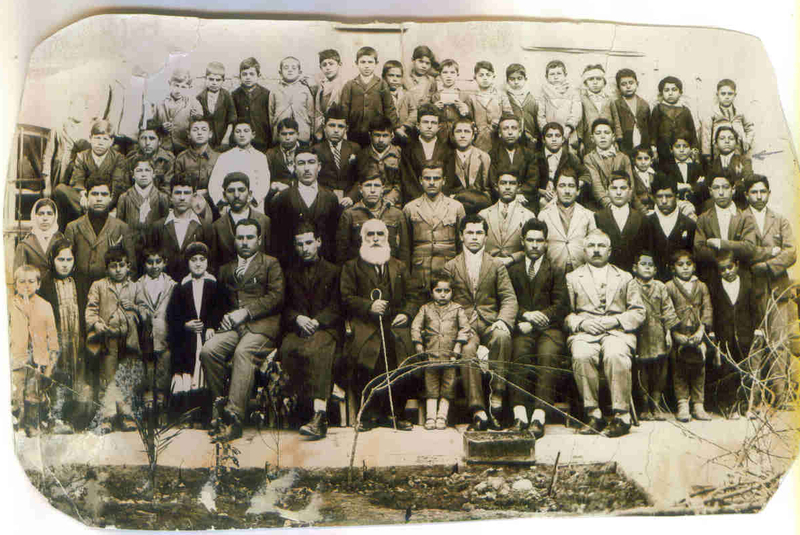 This picture is believed to have been taken in 1925, based on the known age of Emmanuel Elia (second row from top, right side, pointing arrow). Emmanuel was the son of Qasheesha Emmanuel (Qoryaqoos klan) of Matta d-Mar Zia, Jilu. Emmanuel was born on 9/26/1913 and died in March, 1983. He is aged 12 in the picture. This diploma was awarded to Benyamin Yosip Gandaloo, pictured in the 1926 graduation photo (top row, left). Rev. Yosip Qelaita his student Adeeb Toolu, 1938. Student Number see the index photo.